I.Theme – Easter celebrates the reality of Jesus’ resurrection in all its many aspects. Hope, Transformation, Evangelism and a new life. In all the accounts (different from the other Hellenistic accounts of the day) Jesus is VERY present at the Resurrection. He is not a ghost. He is not an apparition. Jesus is very real and very present. The second detail is that the resurrection accounts do something. They make real the covenant community of the disciples. They are about to be sent; they are about to become apostles through the power of the Holy Spirit. The disciple community is formed. One might even say is birthed and bound together by the experience of this very real present Jesus. Luke’s Gospel is known for the role of the women. The fear of Mark’s women is not present here, but rather a sense of purpose. The “men” however have a new purpose for the women – that they relate the news of the resurrection to skeptical disciples, and the remembrance of Jesus’ description of his fate. The women “remember” what the disciples see as an idle tale. Once again, the women tell the disciples but the disciples do not understand. However, the key word for Luke is “amazement.” In Luke’s account, Peter seems to question and wonder what has happened, as opposed to Matthew and Mark. The Corinthians reading is the oldest of all testimonies to our Lord’s resurrection from the apostle Paul. Indeed, the point at which 1 Corinthians 15 stands closest to the Gospels is the identification of Simon Peter (Cephas: verse 5) as among the first to whom the risen Lord appeared (cf. Mark 16:7; Luke 24:34; John 21:1-8). At this point, Paul’s list omits the most obvious part of all the gospel resurrection narratives, when his account is set next to them — where are the women? Paul’s writings precede the writing of the Gospels. It is historically impossible to know what kind of information Paul received from others about the resurrection. The point is that while Paul was late to the Church, Paul senses God’s presence and grace and that Jesus dies to save sinners for all. The Acts reading emphasizes the broader nature of the resurrection spreads the message of Christ to all and in particular the Gentiles. It is Peter’s missionary speech to Cornelius, a Gentile centurion, and his household. The conversion of Cornelius marks an important turning point in the understanding of God as impartial and consequently the outreach of the Church to Gentiles. Many “circumcised believers” (11:2) rejected and feared the possible inclusion of Gentiles in the Church, but Luke makes clear that Peter himself (even before Paul) began the mission to the Gentiles under the direction of the Holy Spirit (1:8) because his idea of God had changed. The Psalms speak to the type of life we receive in Christ. This poem speaks of the final day of salvation and makes a number of points which, for the people in Isaiah’s day, would be regarded as quite revolutionary. In the coming day, the nations will gather as one people in Jerusalem. It will be a time of fellowship, of feasting, a time of great joy for all peoples and not just the descendents of Abraham. It will also be a time when death will be no more; the tears of mourning will be wiped away. In that day all will rejoice in the God in whom they trust. The concept of all the nations sharing in the day of salvation at the coming of the kingdom of God is not new, but was seldom considered by the people of Israel. As for the notion of a defeated death, of no more dying, or even better, of resurrection, this was indeed a novel idea. For us, even now we experience unity in the church through oneness in Christ, and we experience new life through the resurrection-life of Christ. We look forward to the day of Christ’s return when we will all be completely one in Christ and the tears and mourning of death will be wiped away. Vv. 1-2 are a call to thanksgiving: God’s mercy, his “steadfast love”, is everlasting. May “Israel” (v. 2) and “those who fear the Lord” (v. 4) proclaim this! Following this is the the voice of an individual worshipper sounds out, bearing thankful testimony to a personal experience of God’s rescue from a situation of danger and distress (vv. 5-18). The “glad songs” (v. 15) are heard in the Temple, the community of the faithful. The psalmist expects to live to old age (v. 17). The voice of personal testimony includes the striking words, ‘I shall not die, but I shall live, and recount then deeds of the Lord’ (v. 17). He has suffered greatly at God’s hands, as a discipline, but God has preserved his life. He seeks entrance to the Temple (“gates of righteousness”, v. 19) to give thanks; only the godly may enter therein (v. 20). V. 22, possibly based on an ancient proverb, may speak of the king’s rise to power or his victory. On this day (v. 24) God has either saved his people or punished the ungodly – or both. ‘The stone that the builders rejected has become the chief cornerstone’ (v. 22; quoted in Matthew 21:42; Mark 12:10; Luke 20:17; Acts 4:11; 1 Peter 2:7). The clear implication that powerful people in Israel were complicit in the utter rejection of this individual, mistakenly judging him unsuited for the proposed (kingly?) role, together with the surprising news of Yahweh’s subsequent vindication, makes natural the repeated New Testament application of v. 22 to Jesus. In the much larger piece of chapter 15 Paul is speaking to the church at Corinth about the reality that the key belief in the resurrection of the dead for the saints is to be found in the sacred story of Jesus’ own resurrection. In the previous verses Paul has been carefully considering the negative consequences of denying Christ’s physical resurrection. Apparently some of the Christians in Corinth hadn’t been able to shake their Greek idea that salvation meant liberation from the limitations of the body. So, they thought, why would anyone want their old body to be raised from the dead? Paul points out that their denial of physical resurrection had consequences for the whole gospel. “But if it is preached that Christ has been raised from the dead, how can some of you say that there is no resurrection of the dead.” That is the first of seven “if’s” in verses 12-19. If Christ has not been physically raised from the dead, our preaching is useless and so is your faith, you are still in your sins, and those who have died as Christians are lost. 1 Corinthians 15:9-26 reminds us that there is more to this life than what we see. If this is all that we have to hope for, then we are to be most pitied, according to Paul. But there is more that we hope for. We hope for the boundaries of this life to be broken down, that death no longer has the final word. This is what we believe, that in Christ, the ends of this life have been wiped away and the wall between life and death, between earth and heaven, is destroyed at last. Not unlike many non church goers, Paul faced a wide community of belief in a marginal kind of afterlife. He is sure that there is more to life than what we experience here on this earth and he truly believed that for the Christian who believed there would be the inheritance of eternal life with God. We share with Jesus the nature of life in this world and so we will share with Jesus in his resurrection. The words of I Corinthians 15:19-28 elevate Easter far above our individual hopes for the future. Here Paul claims that the resurrection of Jesus set in motion a chain of events that will impact the future of the universe and even the future of God. Jesus is the first fruits of the holy community of saints who will be raised. He then makes his case that humanity is doomed to death if left to their own devices. Only Christ and Christ’s resurrection will bring resurrected life to those who believe. Christ is, even now, bringing about the ultimate victory of death and will (as promised in John’s Gospel) draw all things to himself. In the end death and all shall be conquered. A) Those who follow Jesus and believe in his resurrection will be united with God and the saints in light. B) Jesus is the only one who can triumph over the permanence of death itself; only the new Adam brings deliverance. C) Not only is a way into full life with God made possible and the kingdoms of heaven and earth forever linked; but this work of Christ’s resurrection will be the death of death. D) Finally, this is part of the ultimate embrace of God for his creation. What has begun in God will end in God for God is the Alpha and the Omega. Peter’s address was the outcome of two visions, the first given to Cornelius (10:1-8) in which he was instructed to send to Joppa for Peter, and the second to Peter himself (10:9-16) in which he was directed to kill and eat animals regarded as unclean in Jewish law. It is a summary of the gospel from this newly gained perspective that the mission and good news of the risen Christ who is now ‘Lord of all’ (v. 36b), does not exclude anyone on account of racial or other human-created distinctions. The message to be preached is one that proclaims both the universal authority of the risen Jesus (‘he is the one ordained by God as judge of the living and the dead’ v. 42), and, deriving from that authority, the inclusive promise of forgiveness ‘through his name’, to everyone without exception who ‘believes in him’ (v. 43). He tells the assembled company that God does not favor Jews over others: anyone, whatever his nationality, who reveres God and lives in unison with him “is acceptable to him” (v. 35). In vv. 36-38, Peter summarizes Jesus’ earthly ministry; he applies prophecies found in Isaiah 52:7 and 61:1 to Christ. (Psalm 107:20 says “… he sent out his word …”) Christ is Kyrios, “Lord of all” (v. 36). But, although cursed, the Father “raised him” (v. 40) and “allowed him to appear” to those chosen by God – to be “witnesses” (v. 41). In Luke 24:41-43, Jesus eats broiled fish with them, so he was clearly humanly alive again, i.e. physically brought back from death, resurrected. Jesus, the Kyrios, is the one appointed by God to set up the Kingdom and to judge both those who are alive and those who have died at Judgement Day (v. 42). Then v. 43: he fulfills many Old Testament prophecies: he is the one through whom sins are forgiven. Forgiveness is now available to “everyone who believes”, not just to Jews. The remainder of the reading (vv. 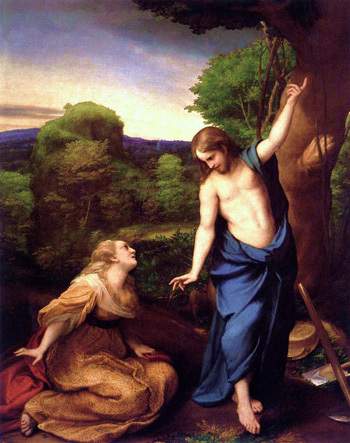 11-18) concentrates on the experiences of the solitary Mary Magdalene in the garden: her weeping (v.11a); her sight of two angels inside the tomb and her response to their question about the cause of her tears (vv. 11b-13); her sudden sight of the ‘gardener’ whom she failed to recognise as Jesus (v.14); Jesus’s identical question to that of the angels, with the additional and significant, ‘Whom are you looking for?’ (v. 15a;) and Mary’s uncomprehending response (v.15b). She recognizes Jesus when he calls her by name. But something has changed: they are in a new relationship: “do not hold on to me” (v. 17). Since he has not yet reached his goal of returning to the Father she must not cling to him or try to keep him to herself (v.17a). Significantly, Mary again becomes an ‘apostle to the apostles’, charge with a message of promise (ascension) as much as of fulfilment (resurrection), conveyed in a manner that highlights the deepened relationship his followers would enjoy with the risen, ascended Jesus as his brothers and sisters, and with the Father as his beloved children (vv.17b-18). John is concerned to show that the order established by the resurrection of Jesus means that we are invited into God’s new world, in which we experience the most profound and intimate relationship with Christ (as brother) and with God (as Father). For Luke, all of Jesus’ resurrection appearances take place in and around Jerusalem, which was the culminating point of Jesus’ ministry. From here the gospel message will spread in all directions to every nation and people. For the disciples, the empty tomb was not a “proof” that Jesus had risen from the dead. Rather, it presented the disciples with perplexing information that led in many directions and demanded an interpretation of its meaning. Only when some divine help was provided (here by the angelic messenger and later by the risen Jesus who appeared to the disciples in Jerusalem and on the way to Emmaus) did the true meaning emerge. The fear of Mark’s women is not present here, but rather a sense of purpose. The “men” however have a new purpose for the women – that they relate the news of the resurrection to skeptical disciples, and the remembrance of Jesus’ description of his fate. The women “remember” what the disciples see as an idle tale. Once again, the women tell the disciples but the disciples do not understand. However, the key word for Luke is “amazement.” In Luke’s account, Peter seems to question and wonder what has happened, as opposed to Matthew and Mark. Like us, the women are told that in order to discover the meaning of his resurrection they must remember everything that Jesus said and did. Only by seeing this event in continuity with his birth, life, ministry and death can they recognize that the resurrection is the culmination of all that Jesus was trying to accomplish. The last very important motif which Luke’ carefully crafts as he tells the story of the resurrection is the crowd. Jesus’ resurrection involves many people. Many people will experience his resurrection. They are to tell many people. It is important in Luke to remember the story of the prophet king Jesus, and how all that he said came true, and how he suffered, died, and was resurrected. More importantly though is that "remembering" is for the sole purpose of telling. Those who entered the empty tomb found no trace of Jesus. Everything associated with his death has been abandoned, even the grave cloths. However, Jesus is very real and very present. He is clear that we are to remain attentive to the work that is about to happen in Jerusalem (note he has changed Mark’s "Galilee"). We are clear that the death and resurrection of the prophet king has now fulfilled the prophecies. The prophetic tale of suffering and death has come true. The whole of the scriptural witness (in that time the Old Testament – and specifically the Torah) is towards this moment of a new covenant and a new thing. It is now the time of an apostolic age; wherein the first followers are sent out to do the work that Jesus has given them to do. In Luke’s narrative there is no 40-day period extending from the Resurrection to the Ascension. He knows these events in a 24-hour period of one day. The day is a new day – the day of resurrection and a new future.